George Van Tassel, contactee, who held the first ongoing spacecraft conventions in the high desert at a place called Giant Rock coined the term "channeling" to distinquish this form of communication from that used by spirit mediums. He likened this form of communication to television where different channels convey information on different carrier frequencies. Channeling was not telepathy and not what we now call remote viewing. George was receptive to a beam of energy that was called a "tensor" beam. This was very similar in principle to microwave communication inducing audio signals in the human brain. However, the tensor beam was more sophisticated according to Van and could induce audio and visio signals so that Van could both see and hear the source of the communication. Frequently this beam had to be tuned as it could "heat up" various body parts if not properly focused. When Van was ready he would indicate to the controller on the other end (who seemed to be in a control room aboard a spacecraft) that he was ready to switch modes so that the audio signal could now emanate through his voice box and his voice would change in pitch and timber and sounded like another personality. The speech was slow and deliberate. I have only witnessed 4 of these tensor-beam channelers in my lifetime although many people claim to channel. This popular channeling is usually just a person who, in a relaxed state, is getting impressions from the subconscious and not actually hearing a voice as if it came from a telephone speaker. Hail to you beings of Shan, I great you in love and peace, my identity is Ashtar, commandant quadra sector, patrol station Schare, all projections, all waves. Greetings, through The Council of the Seven Lights, you have been brought here inspired with the inner light to help your fellow man. You are mortals and other mortals can only understand that which their fellow man can understand. The purpose of this organization is, in a sense, to save mankind from himself. Some years ago your time, your nuclear physicists penetrated the "Book of Knowledge"; they discovered how to explode the atom. Disgusting as the results have been, that this force should be used for destruction, it is not compared to that which can be. We have not been concerned with their explosion of plutonium and UR 235, the Uranium mother element; this atom is an inert element. We are concerned, however, with their attempt to explode the hydrogen element. This element is life giving along with five other elements in the air you breathe, in the water you drink, in the composition of your physical substance, hydrogen. Their efforts in the field of science have been successful to the extent that they are not content to rest on the laurels of a power beyond their use, not content with the entire destruction of an entire deity at a time. They must have something more destructive, they've got it. The governments on the planet Shan have conceded that we are of a higher intelligence, they must concede also that we are of a higher authority. We so not have to enter their buildings to know what they are doing. We have the formula they would like to use. It is not meant for destruction. Your purpose here has been to build a receptivity that we could communicate with your planet, for by the attraction of light substances atoms, we patrol your universe. To your government and to your people and through them to all governments and all people on the planet of Shan, accept the warning as a blessing that mankind may survive. My light, we shall remain in touch here at this cone of receptivity. My love, I am Ashtar About George Van Tassel: Born March 12, 1910, in Jefferson, Van Tassel spent his childhood and much of his youth in Ashtabula County. He had three brothers, Bob, Eugene and Jack. His father Paul died while George was a child, and his mother Myrtle re-married to Frank Hartwell. They had two children, Raymond, who died last year, and Margaret Manyo, who lives in Seminole, Fla.
Frank Hartwell was an insurance man and the family fared well in the 1920s. They lived at 350 West Ave., Ashtabula. Raymond, in a 1996 interview for the Plain Dealer, recalled his half-brother as "the family thinker" who would read for hours and curl his finger through his hair. Margaret Manyo recalls George as a "very, very smart" boy. "George was, from the time he was a kid, always inventing things," she said last week in a phone interview. "He made a roller coaster from the top of the barn and a bob sled." 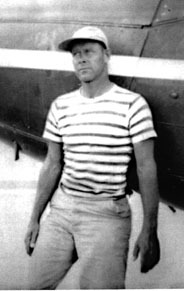 George Van Tassel had a special fascination with airplanes, which led him to obtain his pilot's license while still a teenager. He dropped out of school after 10th grade and took a job at Cleveland Municipal Airport. He hung around northeast Ohio until 1930, and then left for California, where his uncle Glen Paine gave him a job at his Santa Monica garage. George as a young man in California. A year or so later, Critzer wrote to Van Tassel and invited him to the area he'd been mining. Van Tassel and Paine drove to the remote location, where they discovered Critzer living under "Giant Rock," reputed to be the world's largest boulder. The granite stone and surrounding ground had been held as holy ground by the Native Americans. The rock is about seven stories high and covers 5,800 square feet of ground. Critzer had excavated about 400 square feet of space under the rock and lived in the cool cavern year-around. Nothing more appears to have come of the visit. During World War II, Critzer came under suspicion as a German spy and was killed in a botched law enforcement raid on his dwelling in 1942. All his possessions were removed by the government. The potential of Giant Rock remained a latent hope in Van Tassel's mind for 15 years. During that time, Van Tassel established a name for himself as a flight test engineer. He worked for both Lockheed International and Douglas Aircraft in the 1930s. He spent the World War II years flying with Howard Hughes. It is unknown if Hughes' eccentricity and passion for eternal earthly life (Hughes wanted to be frozen until someone could find the cure for whatever killed him) are what influenced Van Tassel to move to the desert. But in 1947, he packed up his wife and three daughters and moved them onto the land surrounding Giant Rock. "He said he got tired of the rat race because California was growing so much," Manyo said. Critzer had established an airfield at Great Rock, and Van Tassel reopened the field and built a cafe there. Manyo said Howard Hughes would fly into the airport on weekends just so he could get a slice of the pie Van Tassel's wife made. The Van Tassel family lived a hand-to-mouth existence off the land. Although they could have lived in Critzer's former quarters, Van Tassel housed his family in tents. It was 1960 before electricity arrived at their Giant Rock homestead. UFO Space Conventions held at Giant Rock attracted thousands. The remote location and spiritual significance of Giant Rock drew seekers to the dessert. Van Tassel believed the rock's crystalline structure possessed great channeling power by virtue of its piezo-electric characteristics. If there was communication from another world waiting to be received, Giant Rock was the place to tap into it. Van Tassel and other believers began a weekly meditation meeting under the rock. This eventually led to what Van Tassel believed were alien contacts received through channeling. In August of 1953, aliens from Venus invited Van Tassel to enter their spaceship. During his visit, Van Tassel received instructions for a machine that could rejuvenate human cells using the natural energy found in the atmosphere. He called the device the "Integratron." Construction began the following year. Manyo said George's brother Jack assisted him although he was not privy to the revelation and plans. Van Tassel's literature describing the project stated that the machine's purpose was "to recharge energy into living cell structures, to bring about longer life with youthful energy." He theorized that the body is an electrical device, and aging was a matter of the cells running out of power. The Integratron, capable of collecting up to 50,000 volts of static electricity from the air, would be a multi-frequency, electrostatic charger for the human body. Davidson said that for disillusioned Americans of the mid-1950s, the Integratron became a Noah's Ark, "a vehicle or vessel that could deliver a chosen lot of followers to a secure place. It's the dream as old as mankind to live forever and have some control in governing our time on earth." Van Tassel funded Integratron construction by using Giant Rock as a focal point for UFO Space Conventions. The first convention was held there in 1954. Thousands attended these events, drawn by Van Tassel's charisma and the desert location. In 1959, conferences led by Van Tassel attracted 11,000 followers. "He got huge donations," Manyo said. "There were so many people who believed in that." She said his project received much media attention, and he was a guest on many television talk and commentary shows. Van Tassel also was a guest speaker at many colleges and universities throughout the country as interest in UFOs heated up in the `60s and `70s. Manyo visited the site many times and went inside the Integratron, but she never attended a UFO convention. "I didn't want to get near them," she said. "They had a lot of kooks who came there, even my brother said there were some he couldn't stand. When they started getting into drugs, then he quit holding them." Nevertheless, Manyo said the family respected George's sincerity and his alien communication stories. "It was so authentic the way he would tell it," she said. Van Tassel wrote six books about his out-of-this-world experiences, including "I Rode in a Flying Saucer." And he started a non-sectarian, non-profit organization for religious and scientific research, the College of Universal Wisdom.